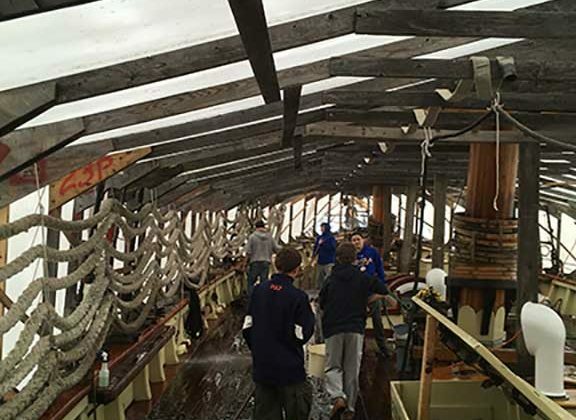 “Long-term layup” of Pride of Baltimore II has now morphed into “winter maintenance” ahead of the 2019 sailing season. Baltimore Boy Scout Troop 35, sponsored by the Church of the Redeemer, joined again as they have done annually for at least a half dozen years. (A number of Boy Scout troops assist with Pride of Baltimore II’s care. Troop 35 was the first, brought to the ship some years ago by Jack Kidd, scout master and longtime friend to the ship.) This shift of focus today is helping the winter maintenance crew clean the ship from layup months gathering dust under her cover of protection from rain and sun. The ship spent her layup months well ventilated while protected from rain and sun. Good ventilation to protect the wood means a lot of road dust from nearby commercial road traffic and commercial marine freight movements. This dust has managed to work its way down below. Part of “good ventilation” for traditionally wood constructed vessels requires having down below areas open, including opening up the bilge wherever possible. With Boy Scout Troop 35 assistance today, that dust is being washed up and vacuumed out. The last step today will be to wash down the deck areas. There is not much dust collection on deck as it was periodically washed down by volunteers through these layup months in an effort at moderating summertime heat effect to the deck &emdash; the goal being trying to keep the deck caulk seams from excessive opening up. This effort seems to have been pretty successful. Alicia Tyrell, Brandon Fiew, Chad Lossing, Matt Peterson, Nancy Lindon, Phil Keenan, Rebecca Rusk, Stan Fowler, and Steve Dunmire were periodic volunteers through the layup months to check on the ship, rinse the deck down, and do minor repairs to the ship’s and shoreside spar covers. Starting Pride’s “reboot” are Chief Mate Jeff Crosby and Cook Phil Keenan, both possessing wood care skills as well as other skills beneficial to the ship. They returned this week for the start of the winter maintenance period readying the ship for sailing in 2019. The winter maintenance work week tradition is Tuesday through Saturday (8-4:30). This work week schedule makes the ship available to any interested volunteers on a weekday or part of a weekend. Soon a notification with details will go out to our Pride volunteers. Examples of areas of possible volunteer interest could be cosmetics or, more immediately, re-assembly of “Sparlandia” (“Sparlandia” is the ship’s shoreside spar cover that got blown down very early last spring, soon after the long-term layup started in mid-February). The overall reboot plan of the ship is to have her ready for her normal compliment of liveaboard crew coming the end of January. Once aboard and oriented, they will immediately start Pride’s up-rig through February.